At Central Christian College of Kansas, our mission is to provide Christ-Centered Education for Character. While our college is affiliated with the Free Methodist Church of North America, we welcome all students regardless of religious preference, race, color, handicap or economic status. Our students come from all faiths and backgrounds – and our college’s character and lifestyle are communicated to each prospective student. Our purpose is to nurture Christian leaders who lead lives of character and service for the betterment of our society and the world. "The bedrock of our education is this: Jesus is spoken here. In addition to developing the skills required to achieve in this world, we take the time to explore what it means to engage our culture from God’s perspective—a Christian worldview. Here at Central Christian College of Kansas, we focus on the student as a whole person. We create opportunities for you to develop not only academically, but also spiritually, socially, emotionally, and physically." Central Christian College of Kansas, an evangelical Christian college embracing the Wesleyan tradition, is dedicated to educating men and women of character who will impact the world for Christ. The mission statement, “Christ-centered education for character,” affirms the ethos that has inspired the College since its inception. Our mission drives us forward to higher levels of excellence and distinction as we seek to glorify God in our programs. Through our residential program centrally located in McPherson, Kansas, and through our global online learning environment, Central Christian College of Kansas is dedicated to providing a Christ-centered education for character. Supporting that God is the source of all truth, we emphasize a balanced application of Scripture, reason, tradition and experience as the measure through which to test and approve truth as we explore, study, and appreciate His creation. Acknowledging that God has called every individual to full devotion to Christ, we are committed to providing an environment through which each individual can develop and sustain a maturing relationship with God. Graduates of Central Christian College of Kansas are engaged in hospitality, social justice, civil discourse and empathetic communication. Graduates of Central Christian College of Kansas possess the needed knowledge to engage in critical thinking and discovery. Graduates of Central Christian College of Kansas demonstrate a commitment to a responsible and healthy lifestyle. Graduates of Central Christian College of Kansas demonstrate stewardship and are seeking opportunities for spiritual maturity. "The mission of the college is [to provide] a Christ-centered education…. [Regardless of faith background] any person is [a good fit] for the online degree. 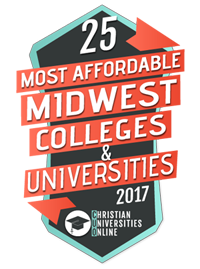 Professionals should be considering Central Christian College of Kansas Online because it gives them flexibility [to maintain their professional and personal lives]." "One of the strongest [traits] of the college is that the professors make themselves available...they want [their students] to succeed."